Loving son of Jean and Ron (dec). Brother of Kaye and Su. Father of Ross and Tam. Grandfather of Jamie, Tasha, Jordan and Ryan. Died peacefully surrounded by his family. He will be forever in our hearts. 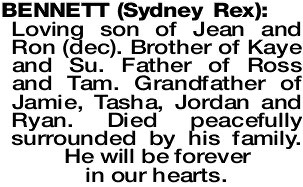 The Funeral Cortege for the late Mr Sydney Rex Bennett (Rex) of Dianella will assemble at the main entrance of KARRAKATTA Cemetery at 11.30am on WEDNESDAY (10.4.2019) for a Cremation Service. 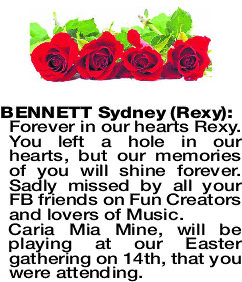 Forever in our hearts Rexy. You left a hole in our hearts, but our memories of you will shine forever. 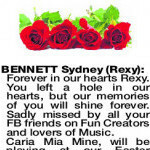 Sadly missed by all your FB friends on Fun Creators and lovers of Music. Caria Mia Mine, will be playing at our Easter gathering on 14th, that you were attending.